With the release of Windows 10 Creators Update v1703 15063, Microsoft has made several changes to the operating system in order to take advantage of the new features and functionality that are introduced, or to switch to more future-proof utilities. One such change is the default to Windows PowerShell. PowerShell is an automation platform and scripting language for Windows and Windows Server that allows you to simplify the management of your systems. PowerShell consists of a command-line text-based shell and associated scripting language that harnesses the power of the .NET Framework, providing rich objects and a massive set of built-in functionality for taking control of your Windows environments. If you’re not a programmer or advanced user of Windows or Windows Server, the good old Command Prompt, also commonly known as Cmd, is an easier choice. Beginning from Windows 10 Creators Update, Windows PowerShell is the default option that appears on Win+X menu (also known as Quick Access Menu, WinX Menu or Win+X Menu) when you right click on Start button or press Win + X keyboard shortcut (if you upgrade, your original setting of using Command Prompt may stay). This guide will guide you on how to revert and switch back to show Command Prompt and Command Prompt (Admin) in Win+X menu, instead of Windows PowerShell and Windows PowerShell (Admin). 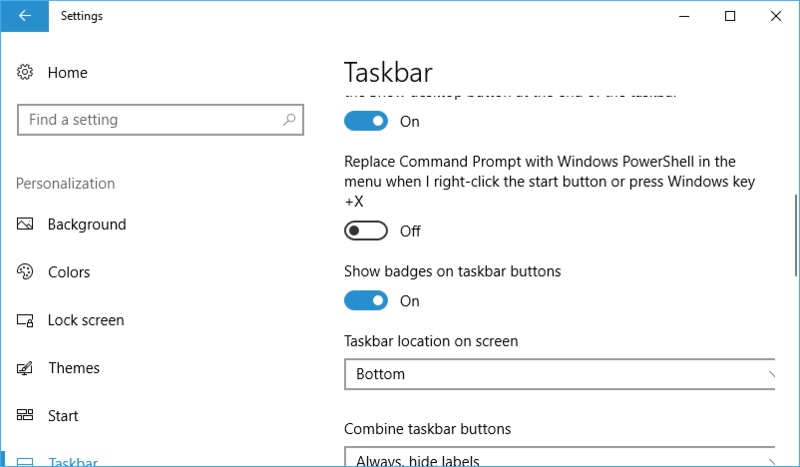 Under the “Taskbar” section, slide the toggle of Replace Command Prompt with Windows PowerShell in the menu when I right-click the Start button or press Windows key+X to Off. 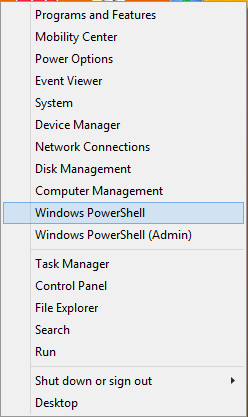 To change back to Windows PowerShell shortcuts, just slide the toggle to “On” for the same option. The change takes effect immediately, and Command Prompt and Command Prompt (Admin) will be shown in the Power User Menu in place of Windows PowerShell and Windows PowerShell (Admin). Save the text as a file with .reg file extension and then run it, or manually navigate the registry hive to change the value of the key (or create if it’s not already available).